We’d love your help. 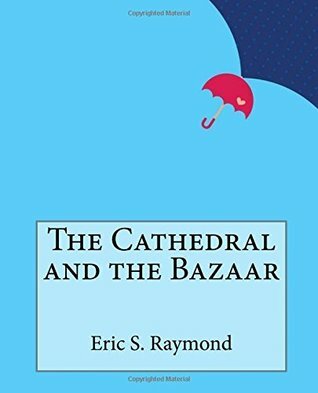 Let us know what’s wrong with this preview of The Cathedral and the Bazaar by Eric S. Raymond. To ask other readers questions about The Cathedral and the Bazaar, please sign up. This book describes two 'modes' or 'metaphors' for software development - the old 'Cathedral' one, in which a few programmers, locked away from the world, slowly release iterations of their software to the world, a mode employed by the business world. Then there's the new 'Bazaar', in which rapid development around a core team of developers is favoured, developers who are constantly in contact with users and co-developers - most of open source software development happens like this. It's an inter This book describes two 'modes' or 'metaphors' for software development - the old 'Cathedral' one, in which a few programmers, locked away from the world, slowly release iterations of their software to the world, a mode employed by the business world. Then there's the new 'Bazaar', in which rapid development around a core team of developers is favoured, developers who are constantly in contact with users and co-developers - most of open source software development happens like this. It's an interesting time-document that directly led to the founding of what's now known as Mozilla, but it's also outdated. Reading the arguments I couldn't help but constantly think 'but what about Heartbleed?' for most points - for those few who haven't heard of it, Heartbleed is/was a huge security bug in the widely used openSSL library that enabled attackers to read arbitrary memory of any SSL-enabled webserver. Especially towards the end the book builds up a few straw-men to take down, and then it gets annoying - like when the book says that 'Bazaar' style development doesn't need the business (Cathedral) world's top-down style management, because open source is just so much fun that it doesn't need managers! 'But what about heartbleed? ': the OpenSSL code is such a notorious mess that for years developers who wanted to fix any problems recoiled as if encountering a Lovecraftian horror, quickly abandoning their good intentions to save their sanity. The argument of 'many shallow eyes see all important bugs' obviously didn't pan out, the bug existed for years. Only now are some openBSD people working on fixing OpenSSL in LibreSSL, but for them it's a concerted effort with 'management' involved, so it seems to be some kind of chimera between Bazaar and Cathedral, in which only very few 'outsiders' are involved. I guess Bazaar style development doesn't work that well for security relevant software; it's insanely complicated and there are too many 'bad' agents (like the NSA) who can act as good 'customers of the Bazaar'. Treating your users as co-developers is your least-hassle route to rapid code improvement and effective debugging. It's a quick read, I'd recommend it to all open source programmers interested into seeing where their hobby comes from. As the Bible of the Open Source definition, this is a 5 star book. It also happens to be one of the few ever written which attempts to explain what open source is and define its motives and mechanics. 1. It too lightly sidestepped the issues surrounding the introduction of a new software version number. The statements and assum As the Bible of the Open Source definition, this is a 5 star book. It also happens to be one of the few ever written which attempts to explain what open source is and define its motives and mechanics. 1. It too lightly sidestepped the issues surrounding the introduction of a new software version number. The statements and assumptions are that bugs in a new version will be seen and fixed quickly, and that a project will be forked if it represents a change in direction not desired. The scale of an application is important in determining whether either of these actions will occur. The management of the project control structure also plays a very significant part in determining what happens with bug fixes and a software cycle. In the decade after the book's publication, Red Hat dropped its "boxed" desktop and desktop end user support. While this was not cataclysmic, it did take about four years before Fedora was able to install and run smoothly on my hardware at the time. Twelve years later, Fedora may now have returned as the most acceptable desktop version to support KDE and bleeding edge development software. That four year downturn interval would have been a problem except for the fact that there were alternative distributions as good or better. I used SUSE at the time. Now, 12 years later, the two major desktop applications have had periods representing major disruption. The KDE group decided to do a complete rewrite of their software - both desktop and application at version 4.0. This was a very buggy version which required a change in interaction with the desktop. It has taken almost 5 years to correct most of the bugs and bring the vision for that desktop experience to a level for the average user to appreciate. Four and five year intervals are a long time in any software cycle, and too long for instability for a dedicated user. By the way - KDE was criticised heavily and lost a lot of users but was never forked and never had a larger number of eyeballs fixing problems. Now the Gnome desktop has performed the same over-the-cliff magic of a major disruptive change in application desktop use underscored partially by the need for a re-write, but also partially to accommodate the growing need for touchscreen application use and also because of the belief of its main developers to simplify the usage of the desktop. In this case, the Gnome desktop shell has been forked, and is being modified in separate stream versions, but it has represented a major disruption in the configurability and interaction with the desktop. When written, the book represented Linux and Mozilla in their early growth and stabilization phases. In a more mature phase, open source is not shining to either established or new users due to the lengthy time disruptions of large scale critical systems. 2. Throughout the last decade and increasingly today, monopolistic enterprises are surviving well in the US court system and are impeding open source just as effectively as ever. Apple is an extensive user of open source and has even been a major sponsor of important projects. Apple is also as closed as any company has been in regard to freedom of use of its products. Microsoft's failures and new OS releases have barely slowed its growth and level of use. It still controls hardware vendors, almost none of which ship with Linux as an OS, and none of which include competitive tools such as Libre Office, or Firefox. The prediction in the book that Windows 2000 would be a major disaster was just unrealistic. 3. A lot of open source startup companies have been purchased and squashed by major corporations. Novell acquired SUSE, but has since floundered. openSuse has been freed, but also suffered from the swings of ownership. Oracle has had numerous purchases, most visibly Sun, which has had an impact on Java, MySQL, and OpenOffice. There are many other examples out there. This type of competitive development wasn't really covered in the Raymond book. 4. Not foreseen at the time of its release, the book doesn't address the growth of Mobile devices which stimulated the use of "Apps" and "App stores". Open source is really being squeezed in this new environment. IOS has a vertical application scheme including licensing and distribution costs. Android is being developed as closed source before release, and seems to have many limitations. For example there is not an effective up to date x86 version of Android that can be conveniently run on any desktop. While the Android SDK kit and emulator are freely available, they may not produce the same result at the hardware level that is see in the emulated environment. Google controls this interface, and as far as I am aware there are no alternative development tools or runtime test environments. The book is an exploration into the world of Open Source, and the culture that goes with it. It goes beyond the definitions and the initial perception and instead gives an inside view of a universe of hackers, magic cauldrons, bazaars and John Locke. Open Source is nothing more than a development methodology, with its own sets of rules and principles. The difference from other methodologies is that the developers are not working in close approximation to each other. They are exclusively communic The book is an exploration into the world of Open Source, and the culture that goes with it. It goes beyond the definitions and the initial perception and instead gives an inside view of a universe of hackers, magic cauldrons, bazaars and John Locke. Open Source is nothing more than a development methodology, with its own sets of rules and principles. The difference from other methodologies is that the developers are not working in close approximation to each other. They are exclusively communicating through the internet. Though for some reason Open Source has become so much more. It is something more resembling a dogmatic approach to software development that by shear force of nature gathers engaged communities, tying them together tighter than most other communities, and included with them are their own social hierarchies formed based on recognition for produced work. These communities are together creating a digital noosphere. Places where ideas and systems and ideas of systems, mingle and crash together to make free and open software. This cultural phenomenon is enabled by the developed connectedness that has come with the internet. In its early days in the 70s- with ARPANET, through the 80s and into the crazy 90s where Open Source became into its own as a great force for both disruption and innovation. I think that open source will be more prevalent in the future, and this book is a great introduction into, the all too frequently used as a buzzword, Open Source. The book is interesting for anyone how is inclined to delve deeper into the world of Open Source, and it will give you a deeper perspective than usually comes when new technology is explained to the uninitiated. This is a collection of essays which are all available online but nice to have in book form. The common theme through all the essays is explaining, from an insider's point of view, who hackers are and why open source software seems to work so well. Although ESR can sometimes brush off the commercial world (and even the academic world) a bit quickly, his essays feel right to me overall. I think he is right about why open source software tends to be of such good quality (frequent small releases, u This is a collection of essays which are all available online but nice to have in book form. The common theme through all the essays is explaining, from an insider's point of view, who hackers are and why open source software seems to work so well. Although ESR can sometimes brush off the commercial world (and even the academic world) a bit quickly, his essays feel right to me overall. I think he is right about why open source software tends to be of such good quality (frequent small releases, users encouraged to submit bugs and become part of the developer community, peer review). However, I think it is going a bit far to say that the factors which make OSS good also make closed source bad. One area where the analysis does seem to be right on is his discussion of why people contribute to open source. The short version is that people contribute to open source because they have a need or an interest in the problem, but they continue contributing in open source because they build up a reputation. This reputation is not for themselves, but for their code and other work. No one can be an open source coder for the reputation, but the reputation is the community's way of letting developers know that their work is being used and appreciated. One way to think of it is that reputation lets people know there is value is working for others, not just themselves. Primeiramente publicado como um ensaio para o um congresso, a obra de Eric S. Raymond acabou se tornado um livro. É interessante notar de como ele divide o desenvolvimento de tecnologias open-source de duas categorias: catedral, onde o código é liberado publicamente a cada nova versão, entretanto, o desenvolvimento está restrito a um pequeno grupo e o exemplo que Raymond cita é o GCC (GNU Compiler Collection); o bazar é o estilo onde cada novo lançamento o código é disponibilizado, mas o desenvo Primeiramente publicado como um ensaio para o um congresso, a obra de Eric S. Raymond acabou se tornado um livro. É interessante notar de como ele divide o desenvolvimento de tecnologias open-source de duas categorias: catedral, onde o código é liberado publicamente a cada nova versão, entretanto, o desenvolvimento está restrito a um pequeno grupo e o exemplo que Raymond cita é o GCC (GNU Compiler Collection); o bazar é o estilo onde cada novo lançamento o código é disponibilizado, mas o desenvolvimento está aberto a todos que querem contribuir e, como exemplo, ele cita o Linux. Outro ponto marcante no livro é as experiências de Raymond com o cliente fetchmail que trabalhou e administrou, comparando o seu desenvolvimento com o do Linux, juntamente, contando 'lições para um bom programador open-source' que aprendeu durante o desenvolvimento da tecnologia e das tedências que observava. This book is a piece of history and an introduction to a culture that (if you're interested in real "hacker culture" and online culture) is not explained at its technological, economic, and social origins as well in any other text that I've seen. No more explanations are necessary. If you are interested in how born-web-native culture works, this is where you start. Must read for anyone who is even remotely related to software development or management. The Cathedral & The Bazaar is a set of essays that documents a specific period in time, the rise of Linux in the 90’s, with a bit of history to explain UNIX and the state of computers up until that point. It does a decent job of giving you an idea of what the open-source community was like at the beginning until roughly 1998. The author, Eric S. Raymond (also known as esr), has been involved in some way or another with open-source software since the movement began in the 80’s, and is also on The Cathedral & The Bazaar is a set of essays that documents a specific period in time, the rise of Linux in the 90’s, with a bit of history to explain UNIX and the state of computers up until that point. It does a decent job of giving you an idea of what the open-source community was like at the beginning until roughly 1998. The author, Eric S. Raymond (also known as esr), has been involved in some way or another with open-source software since the movement began in the 80’s, and is also one of the only people who made it a point to document some of the major changes that were occurring in the industry at the time. The center-piece of this all is the titular essay, which is focused on the author’s experience of developing fetchmail, a Linux mail client, back in the early 90’s using an open development approach. You can read all the essays online for free if you just search the title, but I read the print version, which differs slightly due to added content and errata. I think The Cathedral & The Bazaar could be a decent read, depending on the reader. To get the most impact out of it you would have to be someone who never really studied or read about the history of Linux, does not have a decent understanding of the open-source model, or just wants to learn more about some of the politics involved with open-source. I think these are really the book’s strong points. Other than that, I don’t feel that the book holds up very well. The writing style feels very unfocused at times, with a lot of tangents or meandering that breaks up the flow. This is due to the anthropological theme that the author presents throughout the essays, trying to act as a guide to the reader for the culture and sociology of hackerdom. I think he fails in this regard because he tells the audience how things are instead of showing facts or evidence. There is a lack of hard figures to back up a lot of what he says, which weakens some of the points he tries to make when he throws out percentages, such as “one of the best-known folk theorems of software engineering is that 60% to 75% of conventional software projects either are never completed or are rejected by their intended users,” and “this is called “maintenance”, and any software engineer or systems analyst will tell you that it makes up the vast majority (more than 75%) of what programmers get paid to do.” I suppose we are supposed to take these statements at face value but I sure don’t. There is also a strange need to always point out that “crackers” and “hackers” are not the same thing, and that people twisted the latter to mean the former. This is silly coming from an author that is trying to present hacker culture from an anthropological point of view – language and vocabulary change over time. Some of the things that are written authoritatively, such as Linus’ Law ("given enough eyeballs, all bugs are shallow"), are simply not true. If they were, we would have had things like Heartbleed or Dirty Cow. It feels like security as a topic was simply glossed over because it didn’t fit the narrative he was trying to tell. Good, quick analysis of the strengths of open source software and how an open source project should be managed (at a very high level). Something worth reading for every software entrepreneur and developer, or at least worth skimming. How does a gift economy work? EricRaymond has a collection of essays written over the 1990's looking at the culture o software programming, in particular the subculture that develops and uses open source (or free software). In particular, his writings attempt to explain why does open source not fall into the trap of the free rider problem or the tragedy of the commons. The answer he comes up with are several. One is the concept of 'scratch your own itch'. The idea that programmers find something How does a gift economy work? EricRaymond has a collection of essays written over the 1990's looking at the culture o software programming, in particular the subculture that develops and uses open source (or free software). In particular, his writings attempt to explain why does open source not fall into the trap of the free rider problem or the tragedy of the commons. The answer he comes up with are several. One is the concept of 'scratch your own itch'. The idea that programmers find something that interests them, then solve it and open it to the world and other programmers do the same with the original code as a foundation. Another concept is 'none of us is as smart as all of us.' (my paraphrase) In this programmers who have to solve related problems join in and create a common solution (or a common base). Because each of them has expertise in his field, he has real contributions to make. However, each one of them has a real job, which is something other than writing web server programs (to use Apache as an example). Without open source, the contributions of these programmers would be lost, as they would expend their energies adapting other programs to meet their needs. With open source, the customer can become contributors to the project, and even small contributions can be captured. It's kind of funny to read, because there are so many cornerstones of techno-libertarian ideology presented in the essays. At the time the essays were written it was probably all kind of new and exciting, but nowadays those positions are kinda hard to defend. The parts about Linus Torvalds are gold, as it's argued that he's such a sweet and agreeable person. And it's also pointed out how not attacking the authors and speaking softly are core skills when working in a Bazaar-like environment. I gu It's kind of funny to read, because there are so many cornerstones of techno-libertarian ideology presented in the essays. At the time the essays were written it was probably all kind of new and exciting, but nowadays those positions are kinda hard to defend. A fascinating look at the history of open source software and an interesting attempt to analyse its origins and imperatives. The. book is a bit dated in places and, with the benefit of hindsight, some of the predictions are a bit optimistic, but a riveting read nonetheless. This book gives a very interesting insight into the state of Linux and Open Source in the late 1990s. From a historical perspective it shows the success of Linux and attributes this to using a far more flexible model than previous open source development. That is, Linus Torvalds style of development “release early and often, delegate everything you can, be open to the point of promiscuity” came as a surprise. This was a break from the “Cathedral Building” building process and more like a “a grea This book gives a very interesting insight into the state of Linux and Open Source in the late 1990s. From a historical perspective it shows the success of Linux and attributes this to using a far more flexible model than previous open source development. That is, Linus Torvalds style of development “release early and often, delegate everything you can, be open to the point of promiscuity” came as a surprise. This was a break from the “Cathedral Building” building process and more like a “a great babbling bazaar of differing agendas and approaches.” The author tried to understand how Linux with several thousand developers scattered over the globe did not fly apart in confusion. One of the premises is around the nature of software debugging - especially that “given enough eyeballs, all bugs are shallow”. I recommend this book to those interested in software development and open source. It is an important book with significant insight that the industry at large still hasn’t digested in many aspects. There are many other factors related to software development in this book that are still relevant today. 1. Gift cultures are adaptations not to scarcity but to abundance. I think that many hierarchical organisations are still struggling with the motivation and measurement of developer productivity and many progressive organisations are working to increase the autonomy of development teams with a view to greater productivity. 2. Software is largely a service industry operating under the persistent but unfounded delusion that it is a manufacturing industry. The author uses the question “What is software worth when the producer is going out of business?” The answer is usually close to zero proving that the purchase of software is actually about trust that the producer will continue to enhance and support the software, thus a service relationship rather than a widget purchase relationship. Red Hat from this time and based on the Open Source principles under which it abides sells only support and not software. Selling software for a fixed price and infinitely continuing support does not work. Use value rather than sale value is one alternative way to make money from software and is arguably the major driver of software development. That is, we don’t further develop software because we sold many copies, we develop because people are using it and asking for additional capability. Usability was terrible in most software in the late 90s with attitudes like “Users are stupid” or “Users need more training”. The author knew that Open Source had a major hurdle which was that hackers were good at designing interfaces for other hackers but poor at modelling the thought processes of the other 95% of the population. The author proposed that we need to “learn how to think about what we do in a fundamentally new way, and ruthlessly reducing the user visible complexity of the default environment to an absolute minimum. Computers are tools for human beings. Ultimately therefore, the challenges of designing hardware and software must come back to designing for human beings - all human beings." A twenty year old technology book that has held up surprisingly well. While Microsoft still dominates the desktop, Raymond's primary prediction--that open source models will come to dominate the "back end" and server-side parts of he internet--have come spectacularly true, because of the various reasons he spells out. While I'd be interested in seeing what the thinks of the state of things in the intervening years--with the rise of new tech giants Google, Facebook, Amazon, and a reborn Apple, so A twenty year old technology book that has held up surprisingly well. While Microsoft still dominates the desktop, Raymond's primary prediction--that open source models will come to dominate the "back end" and server-side parts of he internet--have come spectacularly true, because of the various reasons he spells out. While I'd be interested in seeing what the thinks of the state of things in the intervening years--with the rise of new tech giants Google, Facebook, Amazon, and a reborn Apple, social media, cloud computing, and mobile computing--and how these complicate his analysis, I get the feeling there's a lot in his thinking and analysis that still continues to make sense in our very different contexts. --A reflection on the economics of software development. This is maybe the most suspect part of the book, but nevertheless provides some interesting reflections one can use to think through how best to monetize software and fold software development into a long-term business model, especially for a small or start-up business. While not everyone will agree with Raymond's conclusions and not everyone will find every section interesting (the final essay and appendices can be skipped by someone not especially interested in Raymond's personal history or being a "hacker" oneself), twenty-ish years later there's still a lot here that is of real utility and interest. A book that offers a glimpse into the history of hacker culture, unix and open-source world, with the main focus being the open-source development model. An easy and pleasurable read, containing impressive analogies with models from the economical and social domains. Where necessary, the author provides references to studies and other works that go way beyond the technical domain of software development. To me, it was clear that the opinions exposed were properly researched and had a solid basis, A book that offers a glimpse into the history of hacker culture, unix and open-source world, with the main focus being the open-source development model. An easy and pleasurable read, containing impressive analogies with models from the economical and social domains. Where necessary, the author provides references to studies and other works that go way beyond the technical domain of software development. To me, it was clear that the opinions exposed were properly researched and had a solid basis, and this is something I appreciate. Recommends it for: Everyone interested in knowing more about Linux, Open source, Internet, Hacker Culture. This is a great book to read for anyone who wants to know more about the origins of Open Source. Not only did this book break my prejudice that there is no money in Open Source model but after reading this book i got to know of several business models which are thriving on Open source. Linux was one of the main reasons i bought this book but it gave me an insight into the Hacker culture and the history of Hacker culture, where it really started and how it has evolved through the time. There are s This is a great book to read for anyone who wants to know more about the origins of Open Source. There are several interesting analogies used in this book which kept me interested in reading more but some of the things were too technical for me, but it didn't matter because the point the author was trying to make was clear in the overall context. But i would say that if you are looking for details of how to work with Open source then you should probably supplement this reading with something else, which goes into deeper details, but don't put off reading it because there is great value in lessons you can learn from this book. This book is really a must read for people either working in or interested in the tech industry. It makes a very compelling case that open source software has number of advantages over closed source software that will ultimately make it more competitive and profitable. The book and the case it makes for open source was pivotal to the creation of Mozilla which helped stop Microsoft from monopolizing the HTTP and HTML standards. It draws interesting parallels between open source software and Locke This book is really a must read for people either working in or interested in the tech industry. It makes a very compelling case that open source software has number of advantages over closed source software that will ultimately make it more competitive and profitable. The book and the case it makes for open source was pivotal to the creation of Mozilla which helped stop Microsoft from monopolizing the HTTP and HTML standards. It draws interesting parallels between open source software and Lockean property theory and provides a pretty detailed example of spontaneous order in action. This was a pretty interesting contemporary account of the history of the modern open-source movement. There's a lot about the current state of software – both as a developer and as a user – that's been dramatically affected by the people, events, and concepts Raymond recounts. There were some interesting sociological/anthropological observations, such as the parallels that the work open-source developers provide for free has with "gift culture" societies. In some parts, especially the drier & This was a pretty interesting contemporary account of the history of the modern open-source movement. There's a lot about the current state of software – both as a developer and as a user – that's been dramatically affected by the people, events, and concepts Raymond recounts. There were some interesting sociological/anthropological observations, such as the parallels that the work open-source developers provide for free has with "gift culture" societies. In some parts, especially the drier & more academic "Homesteading the Noosphere" chapter, I wished he'd provided some examples of actual projects and people, to better illuminate the concepts. I'm glad I read it (finally! it's been on my shelf for a decade at least), and it was good. In the Cathedral and the Bazaar, the author comments on how free/open source software seems to run counter to Brooks' Law, which basically explains why add adding more developers to a project tends to make it later. Basically, where N is the number of developers, productivity scales with N (at best) but communications overhead within the team scales with N squared. Since developers spend part of their time developing and part of their time communicating, as the communications overhead rises, they spend less and less time developing and more and more time communicating, until such time as adding more developers increases the overhead enough that no additional development is done. Ergo, development tends not to scale beyond a certain point. One and two are magic numbers for development teams. And yet, free software, such as the Linux kernel, has scaled to an astronomical number of developers. How is this possible? The author explains how certain tenets of how open source software is developed breaks these limitations, allowing greater scaling. Also, while proprietary software is developed more like a Cathedral (single, overarching design, lots of people doing specific tasks, not really usable by the public until it's completed) and open source software is more like a Bazaar (different people present different products, people are free to use someone else's product and build on it), you leverage a lot of the capabilities of capitalism to create a broad market of products, with all of the inherent advantages that capitalism brings over, say, central-planned socialism. Homesteading the Noosphere talks about how creating a product and staking your claim in the idea-space (the Noosphere) is similar to staking a claim to land the in the real world. What are the laws and traditions involving who has claimed this land, how has ownership changed, how do you gain ownership? There are plenty of parallels there. This one of the author's strong suits; he's very good at finding useful analogies. The Magic Cauldron deals with how open source software isn't a scarcity or exchange economy (breaking, definitively, any chance of linking it to The Tragedy of the Commons) and, again, finds parallels in the real world. When you better understand a gift economy, you better understand how free/open source software is different from the economy in which most of us live, and you start to see how a lot of the claims about how this will not last, fall flat. All of these are eye-opening. While the material is a bit dated (some of the companies referenced were major players in 1999, but less-known today), the analogies hold up. Which makes the material itself timeless. It would appear that the way to create the greatest quantity and quality of software is to eliminate deadlines (it's ready when it's ready), and eliminate forced assignments (work on what interests you). This is the opposite of what you find in most software development departments within companies. This last essay one was the most mind-bending for me. How many people get paid to write software? A large number of them. How many of these people write software which is publicly sold? About 5% of that number. Most of the software being developed is being developed in-house, for companies, which really isn't transferable to other companies. The software is built to use a particular hardware/software infrastructure which would need to be duplicated elsewhere and is frequently built with business rules and policies which are unique to the company where it is built. As such, the software is not transferable to another company, with different infrastructure and different rules/policies. As such, the vast majority of software being developed is captured, never to be released into the wild. I suspect part of why people donate time and effort to develop free/open source software is that they WANT some of what they've done to escape into the wild. They want to have their body of work seen by more than the handful behind the corporate firewall. I'm certainly in that boat. I can't show my family or friends my body of work, because it's all behind a corporate firewall, never to be seen by the world at large. What is the legacy of all my years of work? Few, if any will ever see it. And that is frustrating. I'm one of the 95% of developers who are developing in-house solutions which will never escape into the wild. While the author doesn't mention this as a possible motivation for contributing to such projects, I think it could be added. Additionally, you have the fact that software development is being managed as a factory: requirements enter here, workforce enters here, software products come out here. Even within companies which are developing software in-house, for in-house use, there is still a factory model. We're developing a product for this, other, department to use. We will bill their budget for the creation of the software. So, we are (implicitly) creating a sold software project. And yet, the real, financial value of the software isn't in the software, it's in the support. Software is a service industry, not a manufacturing industry. All too many companies do their in-house software development, "throw it over the wall" to the users and are perplexed when the users want patches, updates, additions. After all, the environment in which the users work is not static; the software will have to change to adapt to the changes. But, we created and sold you a product. What do you mean, who is supporting it? I needed to do a somewhat close reading of this book for my own book research, and it was instructive to read it all the way through. There is a lot of historical interest here, and a lot that still holds true. However, the fact that "he" is the only pronoun throughout the book sticks out a lot. Not to mention a lot else. Want to more about what I think? You'll just have to read my own book when it comes out. An unexpectedly well written collection of essays. The hacker motif isn't as revolutionary as it was fifteen years ago. Somehow, the movement became mainstream, and this book provides insight into why. Understanding the culture is more important now than ever. While this essential reading is easy for a novice to digest, those lacking technical knowledge are advised to make liberal use of a search engine. A very interesting read, and one that I believe should be read by any computer scientist. The first few chapters are very exciting and a great history lesson. The book lulls towards the end however, especially when talking about the economics of the open source model, but this is still important. It's especially interesting to compare the companies mentioned at the time of writing to how they are performing today. Pretty good perspective on how Linux came to be and how the open source process we take for granted nowadays was born. Reading it now after almost 30 years since Linux itself started makes it even more enjoyable as some of the predictions (like Firefox) have actually happened and many more businesses came out of it, it's pretty impossible to imagine working in any kind of programming job without touching dozens of open source software built the same way Linux was built back then. Este livro é sobre o movimento open source. Foi uma das influências que levou a mozilla foundation a tornar o código do seu browser (primeiro navigator e mais tarde Firefox). É de leitura fácil que levanta questões importante e mostra a importância e características do movimento open source. Já conhecia excertos mas nunca tinha lido na totalidade. If you like books and love to build cool products, we may be looking for you. Eric S. Raymond is an observer-participant anthropologist in the Internet hacker culture. His research has helped explain the decentralized open-source model of software development that has proven so effective in the evolution of the Internet. Mr. Raymond is also a science fiction fan, a musician, an activist for the First and Second Amendments, and a martial artist with a Black Belt in Tae Kwon Eric S. Raymond is an observer-participant anthropologist in the Internet hacker culture. His research has helped explain the decentralized open-source model of software development that has proven so effective in the evolution of the Internet. Mr. Raymond is also a science fiction fan, a musician, an activist for the First and Second Amendments, and a martial artist with a Black Belt in Tae Kwon Do.